Scott’s precise dating of this painting, 2nd September 1939, the day after Britain’s declaration of war with Germany, can be seen as having a highly personal significance. After travelling in Italy for a year or so, Scott and his sculptor wife Mary had, in Spring 1938, gone to live and work at the artists’ colony of Pont Aven in Brittany where they had run and taught summer schools. They were to leave France for Dublin almost immediately after the declaration, and this painting, by its dedication ‘To Marguerite and Vivian for kind services’ was presumably a gift to friends or helpers they had to leave behind. 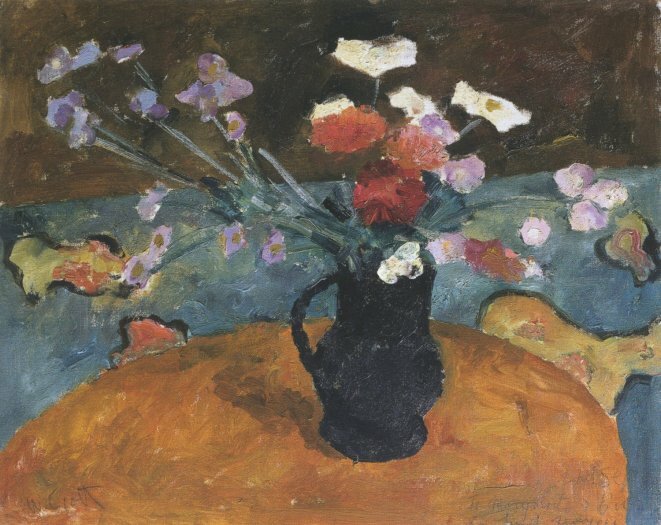 Scott later acknowledged that Pont Aven was where he felt he had begun to discover what he needed as an artist and, in both style and subject matter, Jug of Flowers is highly characteristic of the direction Scott was taking at this period. The still-life themes that proved so central to his later work in particular, now predominated. At the same time the kind of 'primitive realism' (Scott’s own phrase) that he developed in the late 1930s out of his admiration for Rousseau, Bonnard, Cézanne and Derain, prefigures those elements of simple compositional structure, sensuous handling and rich colour that later made him one of the most significant figures of contemporary painting in post-war Britain.